My second week in Alaska brought me to Denali National Park. I set aside time to explore the park and was so excited to have a little solo adventure. 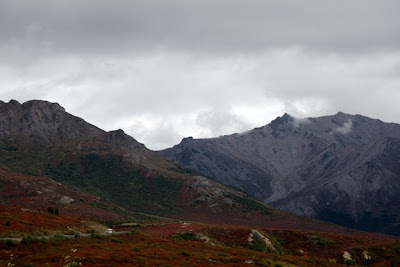 I rented a car in Fairbanks and headed down the George Parks Highway to to Denali, 120 miles away. It was a wonderful drive with mountain tops visible in the distance. 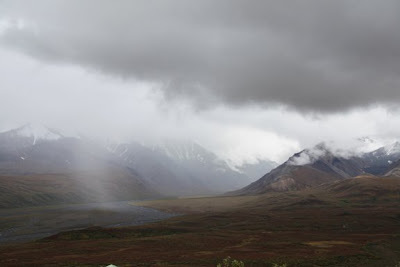 The closest town to Denali National Park is Healy, a little town that I wish I had had more time to explore. 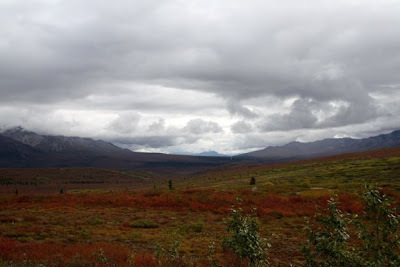 I stayed a total of three days in the area of Denali, touring the park and poking around. Theresa, my host at my bed and breakfast, was a great source of information and had a warmth and great hospitality that made my stay even more enjoyable. For two days I toured the park, mostly by a bus that takes you through the centre of the park, as far as Wonder Lake, 13 hours into the heart of the park. 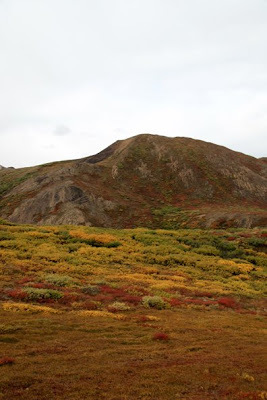 Denali is a very special place, a place that takes pride in leaving the wilderness to itself, all 6 million acres of it. There is only one road into the park, and this is to avoid disturbing the environment. You can hike and camp in the park, jumping on and off the big green buses that snake their way along the narrow gravel road. The colours were out in full force and I can honestly say that they intensified from one day to the next. I saw quite a bit of wildlife in the two days I spent in the park. Snow ptarmigan and snow hare, a coyote, a wolf, three grizzly bears, Dall sheep and two moose were beautiful to see. There were many "Pro Phos" (Professional Photographers) there with huge lenses and camouflage-wear on, ready to quickly set up their tripods at a moment's notice. We could always tell when a moose was around as there would be a gaggle of these Pro Phos huddled by the road trying to catch a glimpse of moose or anything with four legs. 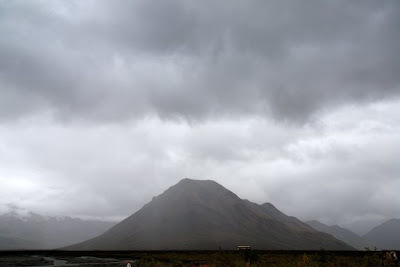 I took the bus as far as Eielson Visitor Center in the heart of the park. It was a full day of driving but I wanted to see as much as possible. The weather was quite different from one day to the next and it created wonderfully different effects on the landscape. 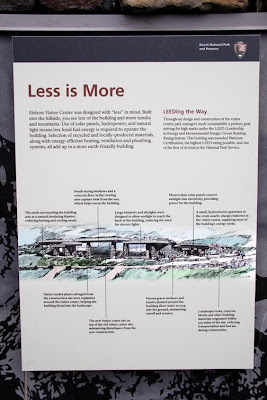 The sign describing Eielson's Visitor Center's unique structure and environmentally responsible philosophy. 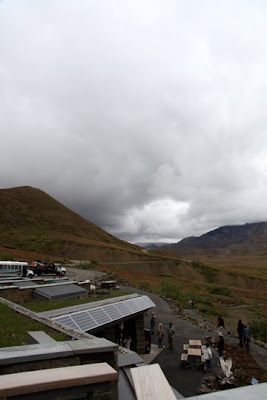 Eielson Visitor Center and lookout was the terminus of my path into the park on both days. It reminded me of Rivendell from The Lord Of The Rings. It seemed to be carved out of the mountain and in reality, it was. It makes as small a human footprint as possible which was wonderful to learn about. 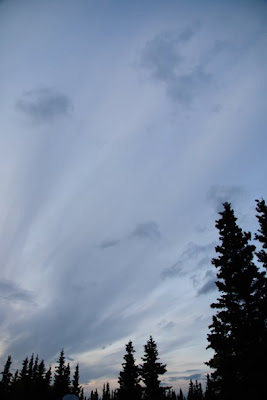 Denali, or Mount McKinley was not visible either day that I was in the park. It is so large that it is only visible maybe 10% of the time. 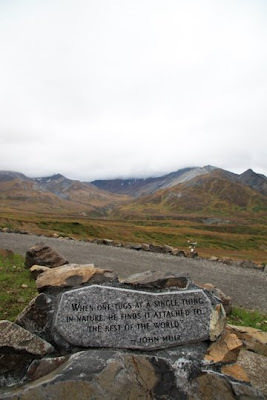 I believe that Chris McCandless, when he was at Bus 142, only saw Denali once or twice. 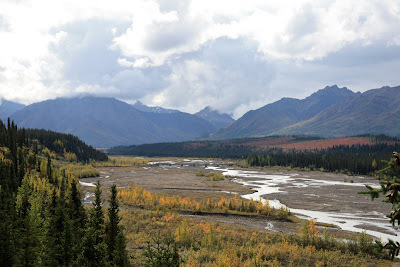 I only caught sight of Denali once in two weeks in Alaska, on the way back from The Stampede Trail with Ed heading up the George Parks Highway to Fairbanks. I could discern its purple spires above the clouds for about five minutes, and then it was gone. 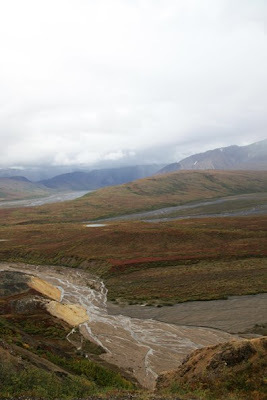 Eielson, carved out of the side of the mountains. A quote from John Muir, intrepid climber, explorer and naturalist. We stopped at about four locations on our way into and out of the park. 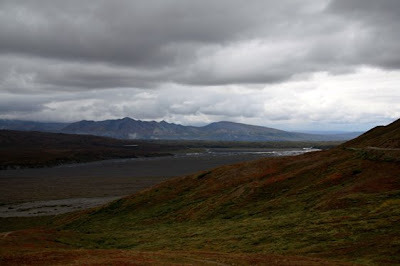 The Teklanika campground and lookout, Polychrome, Eielson and Toklat river lookouts were all places to try to take in as much of the beauty around me as possible. The colours were so muted as to seem almost monochromatic. The second day was just as unique as the first due to the changing colours and new light and weather. J.J. the bus driver was a wealth of information about the park. He talked about the animals and their habits and habitats, the history of the park as well as tips for exploring on foot and and other guidelines to help keep our experience safe and as full as possible. 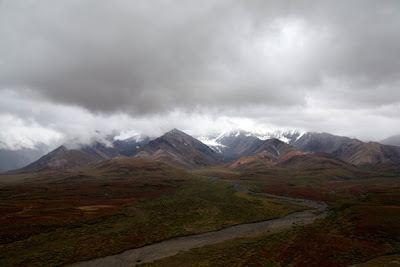 As with other times in Alaska, in Denali National Park I felt as though I was peering into something special, something protected and almost totally undisturbed. I was so happy to know that the animals within its boundaries were safe to live their lives as they should be lived, without the fear of the bullet or the knife. This river is the one that trapped Chris about 16 miles downstream. I thought about that as I watched a much calmer river here. It was still frigid though and we spotted a grizzly bear mother and her cub by the water's edge. 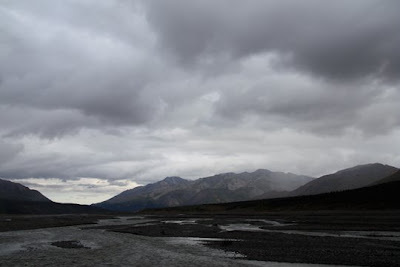 I will always remember the undisturbed vistas of Denali. It is a place that everyone should visit. The colours were like a beautiful quilt upon the landscape, a joy to behold. I knew that these brilliant hues were ephemeral, like everything in life, they would fade and the cycle would begin again next year. That is the beautiful part about the world we live in; that history invariably repeats itself. The bud will bloom once again, as surely as the sun rises each morning. 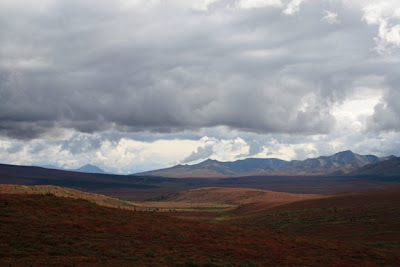 I returned to Healy and spent the next day exploring around and hiring the helicopter to take me back to Bus 142. 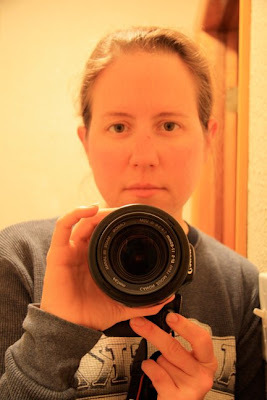 I felt renewed from being in Denali, charged creatively as a spring coiled and ready to leap into action. Sitting on the mountainside at Polychrome and taking it all in, I thought about how really, truly, what we do with our lives and the precious little time we have on this earth is so important. To squander time, money, talent and love is something to fight against and rise above. Share it, make the most of it, grasp it and cherish it. As Emily Dickinson so wisely penned "dwell in possibility". 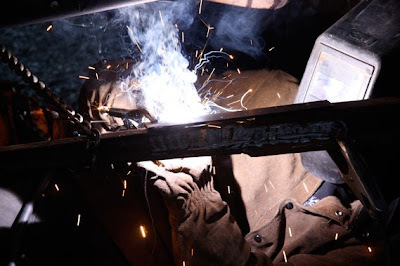 Very cool (no pun intended) read. 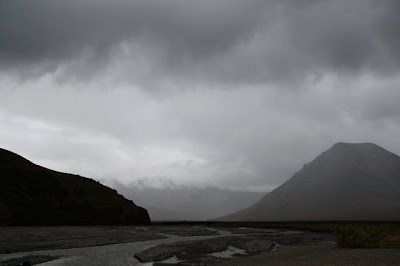 And i love the picture "/Denali13Polychromerain.jpg" and the way the rain is falling.